Prior to the birth of her daughter, Cuban native Katy Espronceda had never been to America. Katy’s daughter, three-year-old Liz, suffers from Arthrogryposis multiplex congenital (AMC), a condition describing a congenital joint contracture in two or more areas of the body. Born with her elbow joints fixed in a bent position, Liz could not bend her arms and had no strength in her hands, rendering her incapable of gripping objects. 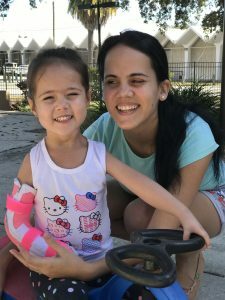 The rare condition led Katy to desperately seek specialty treatment for her daughter, a search that started in their native Cuba before leading them to the United States. Treatment in Cuba proved impossible, the country’s medical capabilities unable to meet Liz’s specific needs. Dealing with AMC presents a unique challenge. More of a physical symptom associated with many different medical conditions than a specific diagnosis, treatment methods can include removable splints, surgery and physical therapy. But locating the right doctors proved difficult, AMC specialists being almost as rare as the diagnosis. Unable to find anyone in their home country, Katy expanded her search outside Cuba, meeting other families with loved ones suffering from AMC along the way but still unable to find anyone capable of treating Liz. It wasn’t until she connected with a family in Columbia through social media that she learned about Shriners Hospital in Tampa. Katy visited Florida in April 2016 for a consultation at Shriners and, six months and a mountain of paperwork later, Liz was finally approved for treatment. Coming to Florida meant leaving their home and journeying to a foreign country, a place where they wouldn’t know the culture or the language. By coming to America, Katy and Liz would effectively be isolated among a country of millions. That’s when one her Columbian AMC family connection directed her to the Ronald McDonald House in Tampa. For Liz, doctors performed surgery on her right arm first, providing a brace to retrain the muscles in her arm to bend at the elbow. Depending on how she responds to these attempts, doctors will next focus on her left arm. Katy and Liz spent the holidays at Ronald McDonald House Tampa, the Spanish-speaking families and staff helping them adjust to their temporary home. And while they miss their family back in Cuba, they also made friends with another Spanish-speaking family at Shriners Hospital. They have now returned home to Cuba, but plan to return to continue Liz’s treatment. And when they come back, Katy knows the journey and arrival will be easier, the staff and families at RMHC will be ready to greet them, their fears of isolation regulated to an afterthought. Editor’s note: Katy & Liz are in Tampa once again to have corrective surgery on Liz’s other arm.